This is an illustrated transcript of The Appeal of King Arthur, a feature I wrote for BBC Radio 3. Broadcast on 24 June 2013. Downloadable as a BBC podcast here. 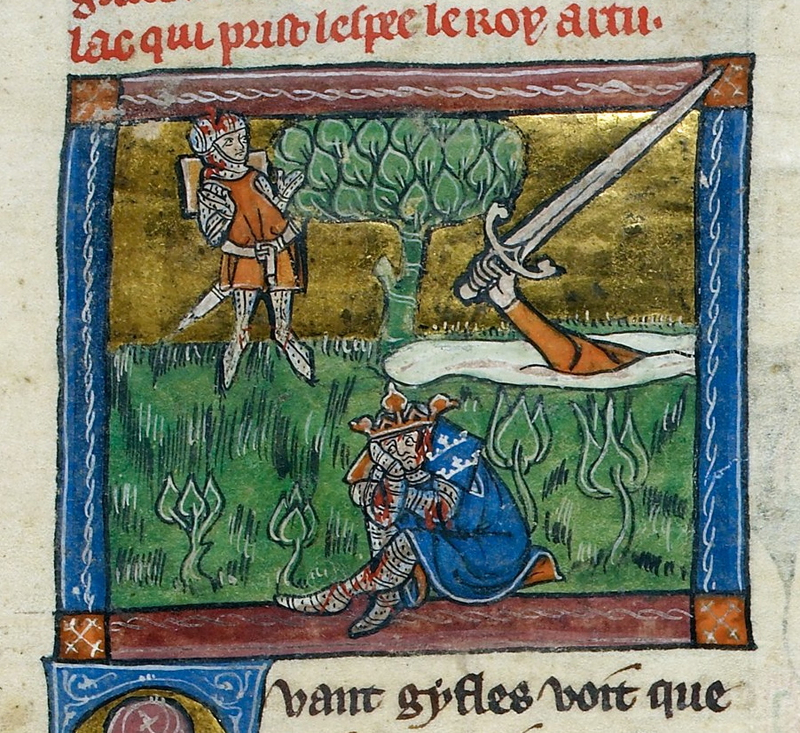 King Arthur returns his sword in British Library MS Additional 10294. 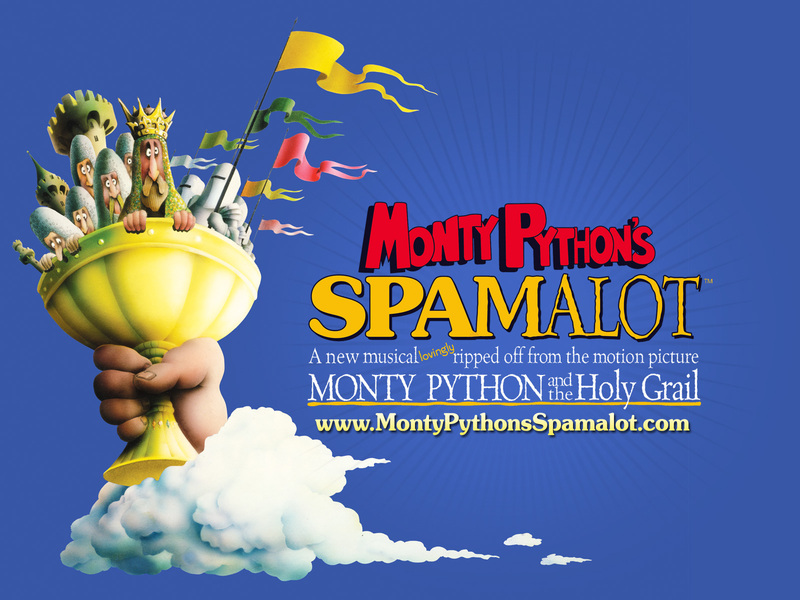 This scene from Monty Python’s award winning Spamalot is part of a musical send up of the Arthurian myth that has appealed to audiences the world over. Its satirical irreverence makes it an odd bedfellow for other Arthuriana in the public imagination like Tolkien’s Fall of Arthur or the BBC’s Merlin, yet each retelling of the myth is testament to its enduring hold across the centuries. What is it that continues to draw us to Arthur’s story and why does it lend itself to such radically different treatments? 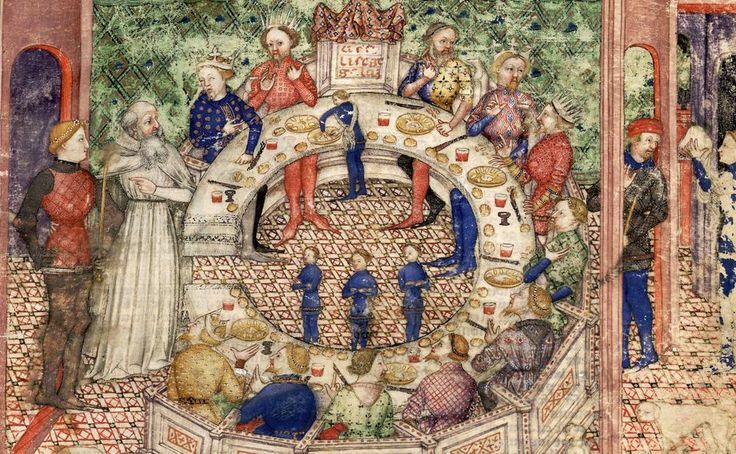 Arthurian fiction has always flourished during periods of social and dynastic collapse. In the twelfth century, the first complete account of Arthur’s reign in Geoffrey of Monmouth’s Historia Regum Britanniae, furnished Britain with a national epic to mitigate a succession crisis. Fast forward eight centuries, to Kennedy’s assassination and we find his presidency idealised as the Camelot era, or, more recently, Merlin, running for five successful series throughout a global recession. In each example Arthur is a touchstone for strong leadership and accord, showing what society could achieve, but never does. Merlin introduces Galahad to Arthur and the Round Table. BnF MS Français 343, folio 3r. 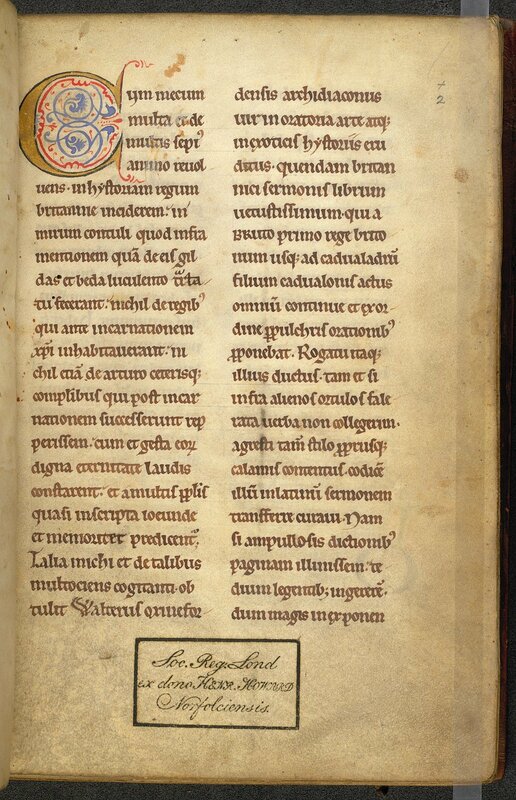 Beginning of Geoffrey of Monmouth’s Historia Regum Britanniae, British Library Arundel 10, f. 2. While Geoffrey uses the legend to reimagine British history as a series of seamless dynastic successions attuned to the imperialism of his Norman overlords, Merlin espouses a multicultural Britain, free of class distinctions, where magic, not race or social background, is a focal point for prejudice. Magic becomes a moral barometer reflecting popular anxieties and aspirations. 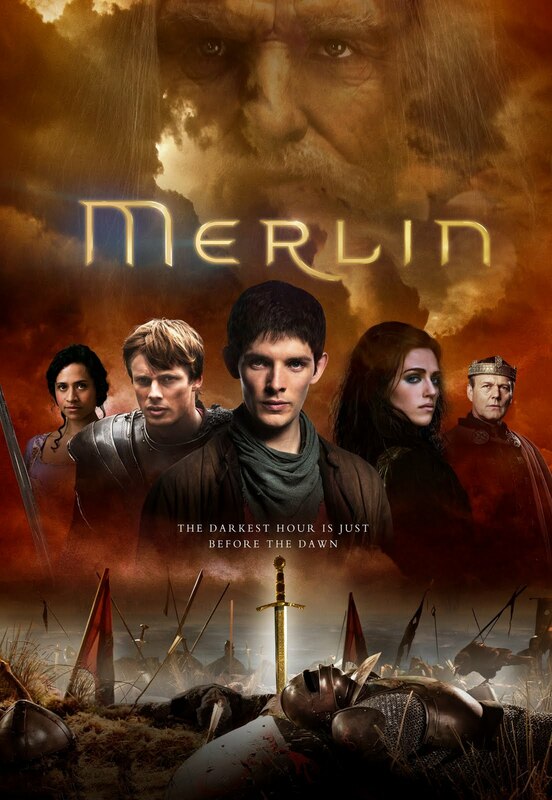 While Morgana uses it for personal gain, Merlin’s magic is socially beneficial, helping characters like Arthur and Guinevere, the servant-come-queen, fulfil their potential for common good. As we sympathise with Merlin’s struggle to reconcile personal and public responsibility, his endless vigil for Arthur’s return parallels our contemporary desire for stability in social and economic adversity. Literature produced during the Wars of the Roses, similarly manifests the concerns of its original fifteenth-century audience. Written when aristocratic factionalism encroached on, and overturned, royal authority, Thomas Malory’s highly influential Morte Darthur depicts the desolation of the Arthurian kingdom as a constitutional crisis reminiscent of the struggle between the houses of Lancaster and York. Remarkably for a medieval romance, it articulates the voice of the lower born men facilitating the noble feud. The silent masses that ordinarily acquiesce to royal power grow weary of war and switch their allegiance to Mordred. 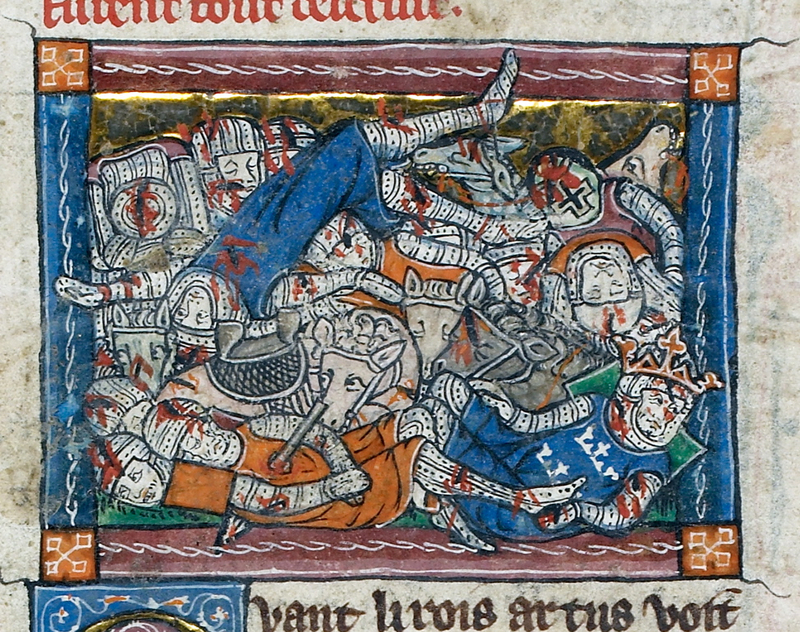 Civil War: The Destruction of Arthur’s Realm as depicted in British Library MS Additional 10294. While Malory leaves us in no doubt that the people are ‘new-fangle’, or inconstant, the text reflects genuine concerns about the role of large groups in maintaining or changing the status quo. Malory’s Arthur prompts its audience to ask persistently relevant questions: where does true power reside, how is it transferred legitimately, and what is the relationship between a leader and his people? Detail of Thomas Malory’s Morte Darthur, British Library MS Additional 59678, f. 35r. Those questions also underpin Dennis the peasant’s rant in Spamalot, as the satirical collision of royal absolutism and proletarian power opens up serious debate about modern systems of governance under the guise of Arthurian parody. As a narrative of nation and community exploring the human condition, Arthur’s rise and fall is the story of civilisation itself locked in an endless cycle of beginnings and endings. That is why Arthur has and always will be the once and future king. 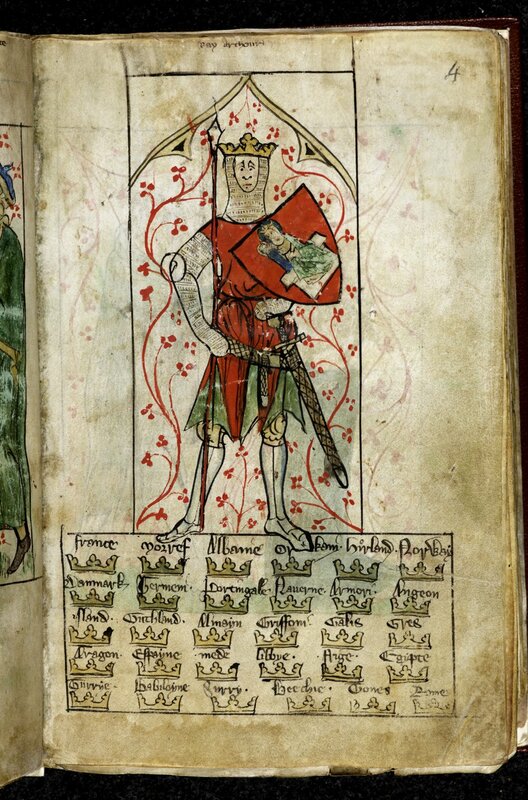 Arthur stood on top of the names of all the kingdoms subject to his rule. British Library MS Royal 20 Aii. Edward Burne-Jones’s ‘The Last Sleep of Arthur in Avalon’, one of many popular Victorian depictions of Arthur . This entry was posted in The Parchment Mirror and tagged arthurian expert, arthuriana, avalon, bangor, BBC, bbc merlin, burne-jones, camelot, Charlie Hunnam, dennis the peasant, Eric Bana, excalibur, Fall of Arthur, geoffrey of monmouth, Guinevere, Guy Ritchie, historia regum britanniae, historical consultant, history of the kings of britain, Holy Grail, J. F. kennedy, JFK, jude law, King Arthur, king arthur expert, king arthur film, King Arthur Movie, King Arthur throughout the ages, lady of the lake, lancaster and york, Lancelot, magic, medieval expert, Medieval literature, merlin, monty python, mordred, morgan le fay, morgana, morte darthur, once and future king, raluca radulescu, snowdon, snowdonia, spamalot, Thomas Malory, Tolkien, Wars of the Roses on February 21, 2014 by Sarah Peverley.